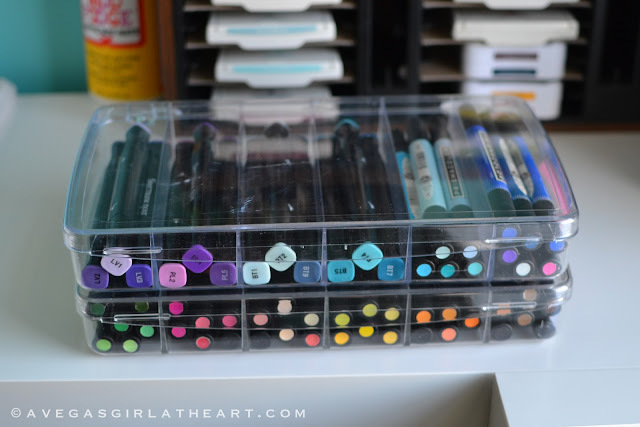 A Vegas Girl at Heart: Embossing Folder & Marker Organization! Embossing Folder & Marker Organization! A friend of mine commented that it seems like organizing my craft supplies is half the fun of crafting. For me, that's quite true. Not only do I come from a line of women who love to organize (there is a serious box and container obsession between me, my mom, and my grandmother), but I love how I can accomplish something by organizing. If I'm having an uninspired day, I might sit and stare around my craft room for a bit, wasting time. But if I have an organizational project, I can finish it and feel satisfied that I completed something. You saw my new scrap paper storage last week. Here's a few other small projects I've been working on. 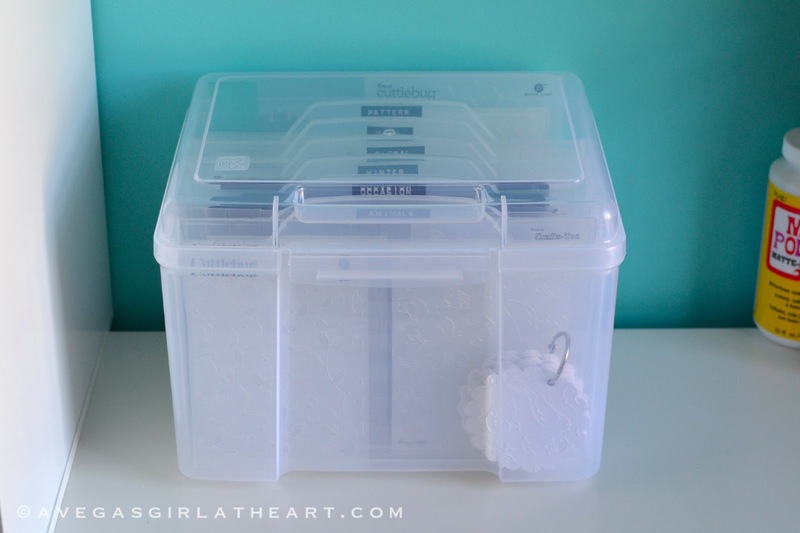 First up is how I'm now storing my embossing folders. I have quite the collection, and previously I had them in a binder with 5x7 pockets. But I wasn't making use of them enough, and I didn't like how they slipped around in the pockets and sometimes fell out of the binder. I picked up this Iris Card Keeper at Michaels. It comes with 6 dividers, perfect for sorting my folders by theme. I used my Dymo to label the categories. I love how deep the box is, because it fits my Sizzix texture plates, which are larger than the embossing folders. I can also stand my 5x7 folders up and the lid still closes. Perfect! By the way, during the organization process, I found two embossing folders that I no longer need. They're up in my shop in my destash section, cheap, if anyone wants them. So that I could see which folders I had easily, I made up a little sample book. This wasn't my idea, I found it on Crafting With Class. I just punched out 3" scallop circles and ran them through my Big Shot so I had a sample of each folder. I also organized some of my markers this weekend. At Target, I picked up four of these Kraft colored pencil cubes for my Stampin' Up! markers. 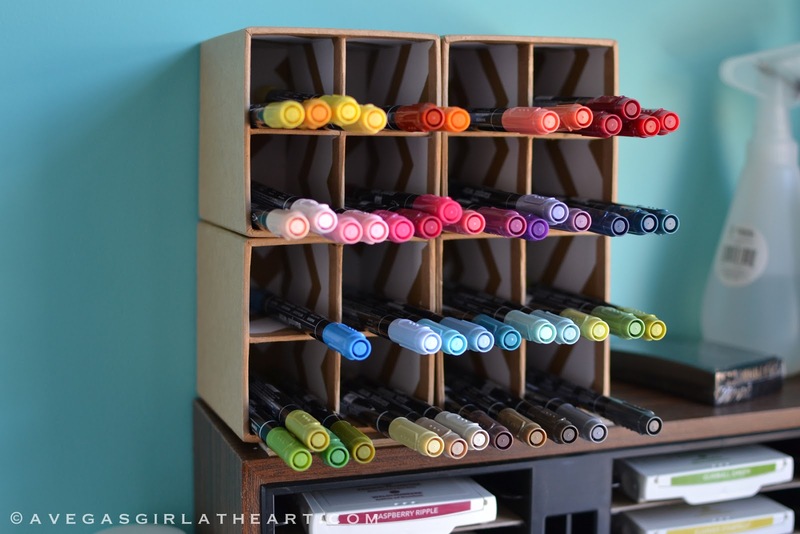 I like that I can see the colors and quickly grab a marker when I need it. It was a pain digging through them in a big bin. 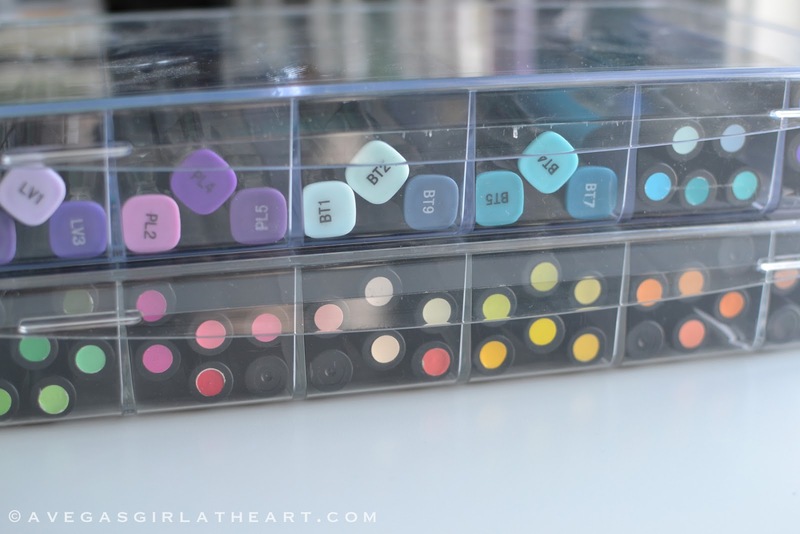 And I used two of these 6 compartment ArtBin containers (leftover from when I started purging my beading supplies) to hold my Prismacolors and my Spectrum Noir markers. I only have a couple of the sets of SN markers so far, so they fit nicely. I do have a few more containers that I can pull when my collection gets larger. Again, I love that I can see the colors on the ends through the containers. It feels so nice to have everything so neat and accessible! 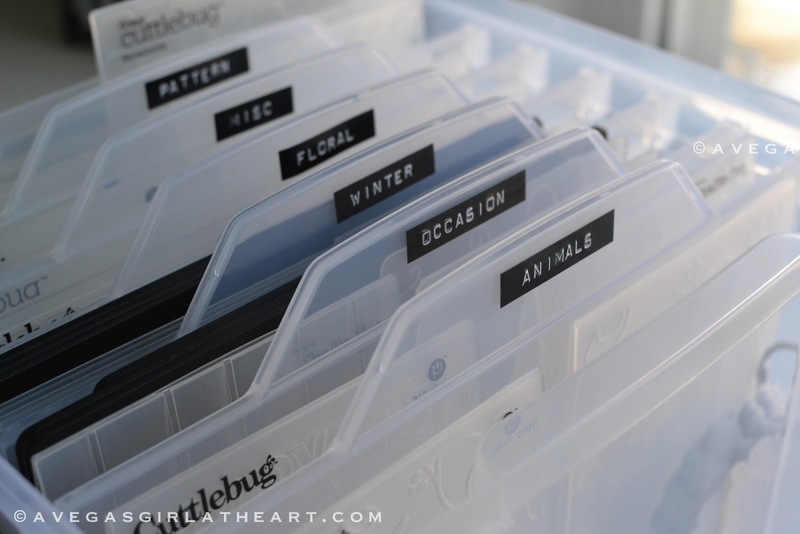 Hi, this is my favorite embossing folder storage idea, could you tell me about how many you can fit in? Thank you! Around 6 or so comfortably in each section. So 36ish? Love the sample book idea, what's the name or number of the one with the birds? I love it !! 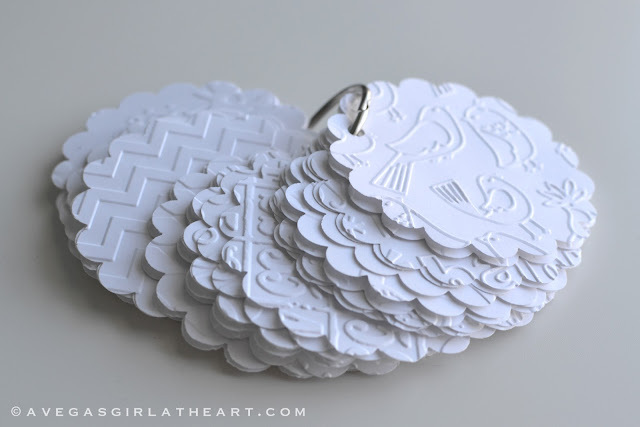 Off to find an Iris card keeper and get my embossing folders organized. Thanks for inspiring me. I am a former beader too and need to reorganize and let the beads nap in the back for now. I have two questions. What about your smaller folders and mini strip folders? 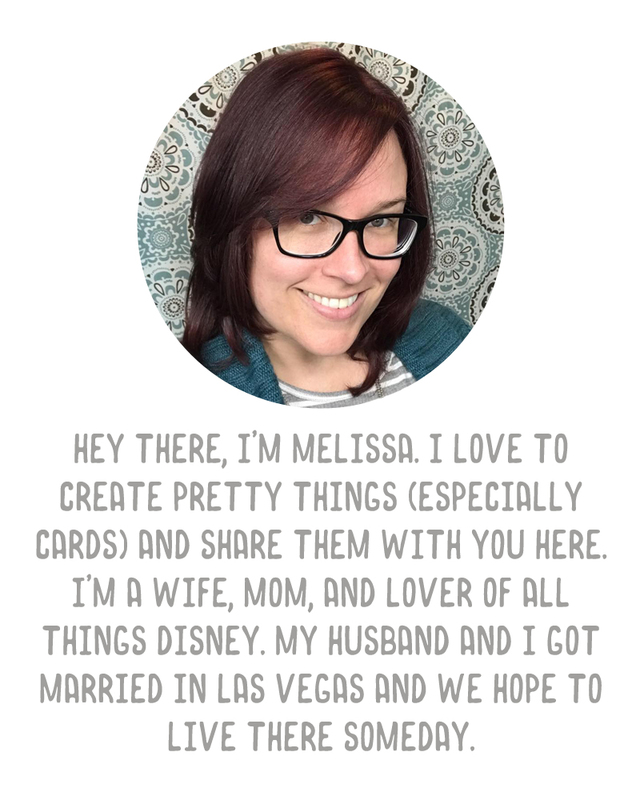 Also, may I ask what white cardstock you use? Your embossing looks so crisp. The white card stock is Georgia Pacific 110# from KMart. I store everything together, I don't separate by folder size, just by pattern.